And you thought we were going to pick Santa, didn't you? 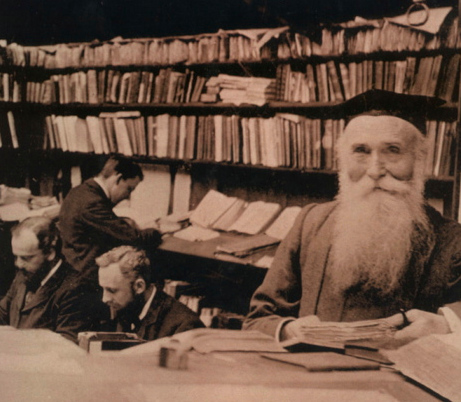 James Murray was the primary editor of the Oxford English Dictionary and worked on it for 36 years until his death. The full dictionary wasn't complete until thirteen years later, encompassing 12 volumes and containing almost 500,000 words. Oh and in case you were wondering how we know this, it's all in an awesome book called The Professor and the Madman. You should read it. Forms: OE–ME beard, (ME bærd, beord, burde), ME–15 berd, (ME–15 berde), ME–15 beerd(e, 15 (Sc. baird, beird), 15–16 bearde, 15– beard. Etymology: Common Germanic: Old English beard ( < earlier *bard , *bærd ) = Middle Dutch baert , Dutch baard , Old High German, modern German bart , Old Norse *barðr retained only in compounds as Langbarðr (but cognate with barð neuter, ‘brim, edge, beak, prow,’ whence sense 11 below) < Germanic *bardo-z (not known in Gothic); cognate with Old Slavonic barda beard. Kinship to Latin barba is, on phonetic grounds, doubtful. 1. The hair that grows upon the chin, lips, and adjacent parts of an adult man's face; now usually excluding the moustache, or hair of the upper lip. How Well Do You Know Your Facial Hair?